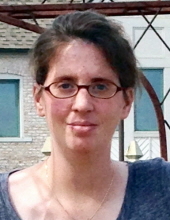 Christie Rae Lucken, age 41 of St. Croix Falls, WI, died Wednesday January 23, 2019, at Regions Hospital in St. Paul, MN. In lieu of flowers, memorials are preferred to the Lupus Foundation of America. To send flowers or a remembrance gift to the family of Christie R. Lucken, please visit our Tribute Store. "Email Address" would like to share the life celebration of Christie R. Lucken. Click on the "link" to go to share a favorite memory or leave a condolence message for the family.